This plant belongs to the family Geraniaceae. The Dutch name of the Cranesbill Geranium’s. It ‘ has yellow-green leaves and purple-colored flowers and has dry-moist nutrient-rich soil. The best place for this plant is: sun. The leaves after flowering stalks and ugly hit flat on the floor. Cut the plant after the flowering of a few centimeters above the ground. From the ground, new leaves and the plant will bloom the same season exuberance. 3-4 years after rupture. This is one of the best perennial geraniums you-can-nom It flowers profusely, almost all at once. Like a lot of geraniums if you cut it right back after the first flush of flowers, it again May Flower Towards the end of summer / early autumn. Give it a feed or fertilizer soluble general purpose and this helps it along. This Plant will tolerate all but the soils and prefers sun or boggiest. However It will also perform part in shady sites. This plant is commonly called Dalmatian cranesbill, is a herbaceous species of plant in the Geraniaceae family. It is cultivated as a garden subject for its low mounding habit and soft mauve colored flowers. It belongs to the family Geraniaceae. It has dry-moist moderately nutrient-rich soil. The best place for this plant is: sun. 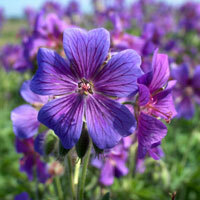 This geranium grows in any good garden soil. The leaves after flowering stalks and ugly hit flat on the floor. Cut the plant after the flowering of a few centimeters above the ground. From the ground, new leaves and the plant will bloom the same season exuberance. 3-4 years after rupture. 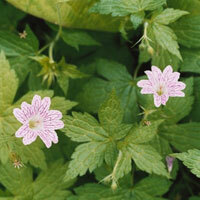 Hardy geraniums are wonderfull filler plants for any landscape, either residential or commercial. They blend nicely with most other perennials and offer continuous color throughout the summer months. It’s a small geranium of only 20 cm high, but with so beautiful leaves. It would be deciduous, but this mild winter has retained his tray. Does not flower abundantly and quietly covered the ground. The intention is to use it as ground cover in the prairie border. Reminiscent of a Cuban sky, the huge striking blue flowers with white hearts and deep purple veins have a fluorescent feel to them that they almost seem to glow. Unfussy on soil conditions in sun or partial shade. Hardy perennial. A favorite for its excellent habit and late spring to summer blooming period. 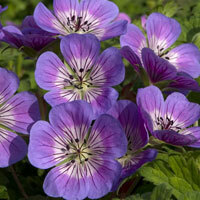 Not to be confused with annual Geraniums, these are hardy perennials that will return year after year. Plants are blanketed with five petalled flowers and the foliage is attractive and aromatic. Can be used as a groundcover in sun or shade. 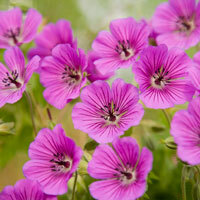 Joy is a cross between Geranium Geranium elegans and traversii lambertii, both are not so easy to keep geraniums. “Joy” has a long, rich bloom with indescribably beautiful, soft pink flowers with darker veins. Shiny leaves with a silvery appearance, somewhat like marble. Mound forming habit with veined soft purple flowers produced over a long period. Very dark purple leaves form relatively short, dense mounds of foliage. Leaves dark green color with purple highlight. It´s an ideal plant for shady spots savagery, such as under trees and shrubs. Shiny green leaves and lilac-pink flowers to 30 cm. The plant quickly forms dense foliage with rich bloom. 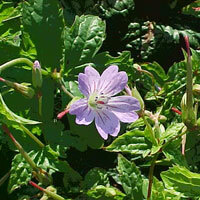 The purple foliage on these cranesbills nicely offsets their blue flowers. It´s an herbaceous perennial with a mounded form. Its relatively fine texture sets it apart from other garden plants with less refined foliage. This is a relatively low maintenance perennial, and should only be pruned after flowering to avoid removing any of the current season’s flowers. Deer don’t particularly care for this plant and will usually leave it alone in favor of tastier treats. It has no significant negative characteristics. This a good flowering Geranium. He is hardy and blooms continuously with a mass of small fluorescent pink flowers Cherise. In full sun it is excellent. Also nice in hanging baskets. This a good flowering Geranium. He is hardy and blooms continuously with a mass of small fluorescent pink flowers. In full sun it is excellent. Also nice in hanging baskets. It has a wonderful velvety, pale blue to gray-green lobed leaves. This cross between renardii and platypetalum grows very much better with a lavish profusion of blue flowers than the species. It’s a beautiful plant with large pink purple flowers. It also has a lovely leaf pattern of yellow dots. Blooms until the first frost as usual. Strong plant in a border can not be missed. 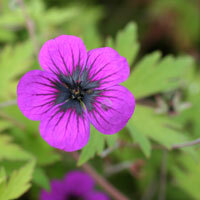 It is a Geranium with flat petals.The garden is undoubtedly one of the most common types of geranium. It blooms with deep purple-blue flowers. 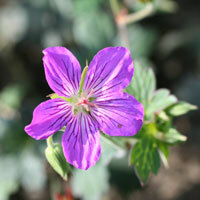 It is also one of the strongest species of the genus Geranium. 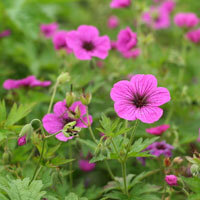 This vigorous Armenian cranesbill produces a mass of shallow cup-shaped, vivid magenta flowers with black centres and veins from early to late summer. It quickly forms loose hummocks of deeply cut, mid-green leaves, which turn a fabulous shade of red in autumn. An excellent plant for the middle of the border. Ornately lobed leaves create a pretty base for the magenta and black-eyed flowers high above the Red Admiral cranesbill. Blooming occurs from midsummer to fall, this hybrid perennial is an upright, clumping plant requiring little maintenance. This is as a Geranium ibericum intersection. Lavender blooms with a mass of flowers. Plant them in a large area or large groups across the border. 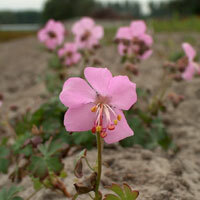 Geranium magnificum would sometimes disappear from foot rot. Geranium Sebani Blue is a lot stronger. A wonderful asset. Dutch name is Cranesbill, the family Geraniaceae. The flower color is pink and the leaves are green, hairy and about 25 cm. high. Tolerates temperatures down to -20 deg. C. The recommended planting distance is 33 cm. 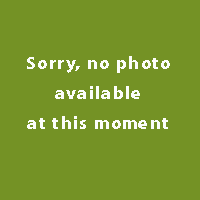 Is widely available. Each flower with large deep crimson centre. Erect habit with finely divided deciduous leaves. Magnificent red autumn foliage. Non invasive. Moist soil. Sun or shade. It has green leaves and a blue-purple colored flowers and has moist soil. The best place for this plant is half shade and sun. 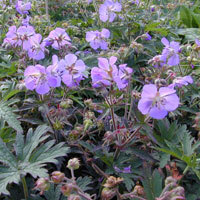 Geranium ‘Sweet Heidy’ has large pinkish-violet flowers with a white center and dark purple veining. . It works well weaving among taller, sturdy plants, or use along a wall where it will cascade over the edge. It likes to be planted a little deeply in well-draining soil that dries out completely between waterings. It is extremely drought tolerant and will actually falter in wet conditions so avoid too much water. 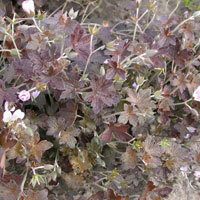 This is a low-growing geranium with bronze foliage in spring, maturing to dark green by summer. Magenta-purple flowers with a white eye cover the plant with bloom in May and continue if the weather is relatively cool. Amazingly floriferous, each petal looking as if it has been drawn on with a coloured pencil. Semi-evergreen mounds of foliage make great groundcover, slug and rabbit resistant, attractive to bees and not fussy on soil conditions in sun or part shade. Hardy perennial. It belongs to the family Geraniaceae. The Dutch name of the Cranesbill Geranium’s. It has green leaves and a blue-colored flower. It has moist soil. The best place for this plant is, half shade and sun.